The T1000 low profile torx bit set includes 12 different sizes. The wrench drive side fits securely on any 10mm, 12mm, or 17mm wrench or socket. The design provides additional strength and a lower profile than standard ratchet drive hex sockets. The ball dent and bottoming shelf securely holds the bit into the drive unit. 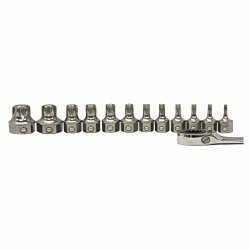 Fits on any 10mm, 12mm, or 17mm wrench or socket. Ball Detent holds the bit into the drive unit. If you have any questions about this product by E-Z Red, contact us by completing and submitting the form below. If you are looking for a specif part number, please include it with your message.